Recover not only photo and video, but also music, PDF, document and other files. 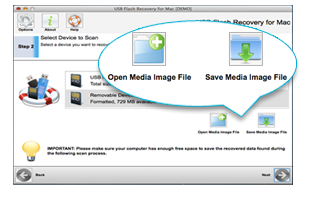 Fully recover photo, video and other files from USB, memory card or other storage devices. Scan and preview all recoverable photos before purchase. The first to supports recovery of RAW images and HD video taken by SLR camera or video camera. 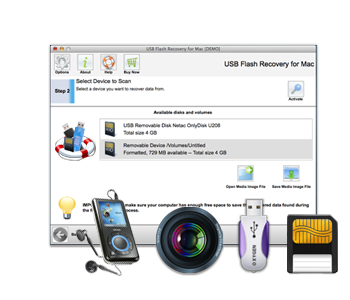 The best photo recovery solution designed and optimized for USB Flash Drives and Digital Cameras. It provides the most fast and safe way to recover any files deleted or lost in your USB, Memory Card, or any other type of storage media. It can even recover data from a formatted or logic damaged flash media. In other words, as long as your storage media is NOT seriously broken in physical, and the files are not overwritten by new files, the software would have a good chance to help you to get your photos and files back. 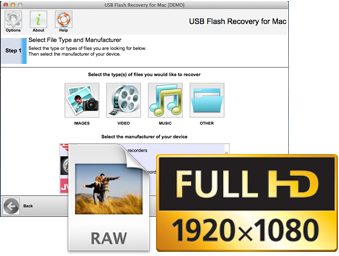 Comparing with other Mac photo recovery software, 321Soft USB Flash Recovery for Mac may recover any type of files saved in the flash storage media. The files include photos, music, videos, PDF, office documents, and so on. Especially, the software can recover RAW and HD Video files which other software can't offer. And we also offer continual upgrade to support the newest digital media storage and media formats. Did exactly what it said it would. Straightforward user interface! I accidentally formatted my SanDisk flash card while on vacation in Hawaii. 321Soft recovery software saved me! thanks to the software team. - by: Catherine on NOV 22th, 2018. This is an exciting app that I recommend for everybody. It is very easy to use and have support for recovering GoPro and DJI drone cameras. 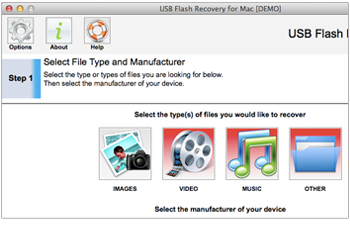 Have a minute, see why the "USB Flash Recovery" is the best tool of this kind of software. 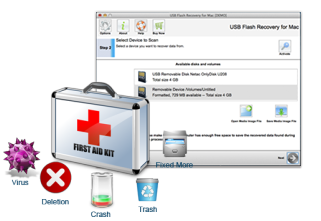 Firstly, it's very safe to use the "USB Flash Recovery", and you needn't worry about that it may destroy your files. USB Flash Recovery will only scan and read your storage media, it won't try or attempt to repair any damaged storage media, let alone write anything to your storage media. And it should be mentioned that in default the recoverable files will be saved to your hard disk automatically, but you can specify to save to other storage media. Anyway, it won't save the recoverable files to the storage media which you need scan and recover files from, this way it will avoid possible operational mistakes effectively. 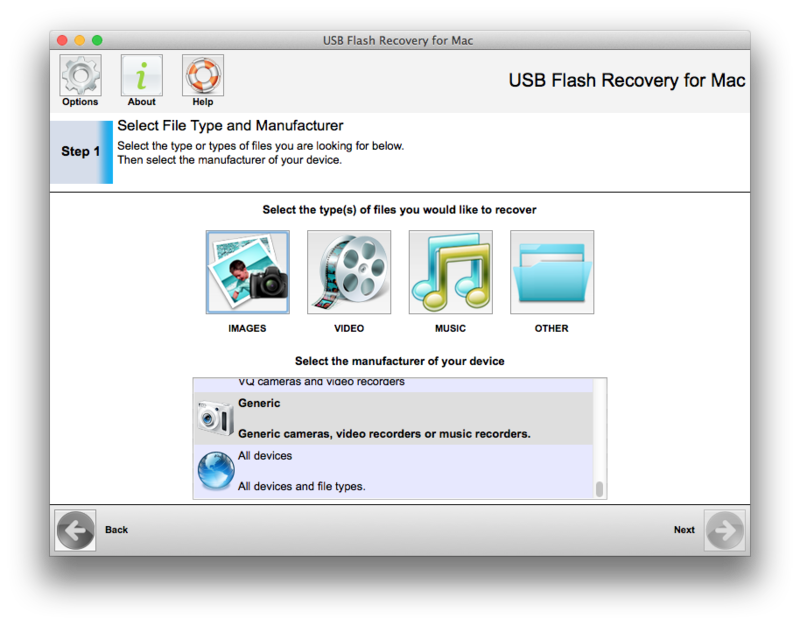 Secondly, the "USB Flash Recovery for Mac" is incredibly easy to use. It will guide a user through the whole recovery procedure step by step. At each step, it will explain clearly with useful tips and hints, so that you may well understand how the software works. With the wizard and intuitive user interfaces, the complex data recovery operations will be turned into a few simple mouse clicks finally. And there are also powerful tools and advanced options which are available to the technical staff and advanced users. 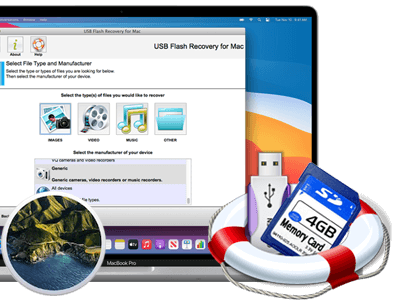 USB Flash Recovery for Mac supports all kinds of flash storage medias which will included but not limited to USB, SD Cards, CF Card, XQD Memory Cards, USB Medias, and so on. (But it will NOT support hard disk). Anyway, the software will support all of the above storage medias as long as your computer can recognize them. And we have successfully tested some storage medias of brand names including Sony, SanDisk, Kingston, HP, PNY, Lexar, Panasonic, Lowepro, Samsung, Transcent, Sony, PQI, etc., and it supports all card readers. The latest version of software now have support for recovering photo and video from GoPro and DJI drone cameras. Not only recover photos, videos, but also recover files of any kind. 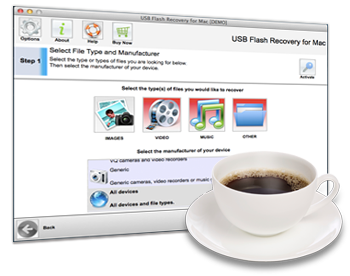 Other than recover photos and videos, the software "321Soft USB Flash Recovery" can also recover other files like Documents, spreadsheets, PDF, emails, archives, Text files, and so on. And it offers flexible options, so that you may choose to recover photos, videos and other files at the same time. And you can also choose to recover photos or videos only. Recover RAW Photos or HD Videos. RAW is a kind of file format provided by professional DSLR cameras. The advantage is providing a more perfect photo quality. But each DSLR Camera manufacturer will provide its own RAW format that is different from each other, for example, Canon offering CR2 or CRW, Sony offering ARW or SR2, Nikon offering NEF, and so on. 321Soft USB Recovery will adopt the most advanced algorithm to fulfill a high quality RAW recovery. And it the world's first software that can recover AVCHD or HD video from a professional Digital Camcorder. There are dozens of brand names of popular Digital Cameras and Camcorders built in the software including but not limited to Canon, Samsung, Nikon, Olympus, Sony, Pentax, etc. Retrieve your lost data in any case. During a deleting or formatting operation, almost all digital cameras won't erase the data permanently. So the software "321Soft USB Flash Recovery" can recover your lost files back, as long as the original data has not been overwritten, no matter how the files were lost from your storage media. It may because that the files were deleted, or your SD card was formatted, or there is a crash happened, or you see an error message appearing, even your storage media was damaged, and so on. Recover photos from corrupted or damaged USB/Cards. With the software's image backup function, you can create a mirror copy of the entire memory card or USB drive easily. The function would be especially useful, when your Flash Card or USB drive got corrupted or damaged. In this case, I would suggest you to make a mirror copy of your flash card or USB drive, which is an image backup file. Then you should scan and recover data from the image backup file. By this way, it will not only improve the chance of a success recovery, but also avoid the possibility of further data loss. Save recovered data automatically and you can even let the software to burn the recovered files to a CD or DVD. Show photo's thumbnails in scrolling mode during scanning period. You can start, cancel, pause, resume a scan anytime easily as you like. Zoom in to preview a photo when click on a thumbnail, and you can view its properties. It won't compress your photos or files, so there are no lost in quality. Support 22 different languages including English, German, Italian, French, Japanese and so on. The World's No. 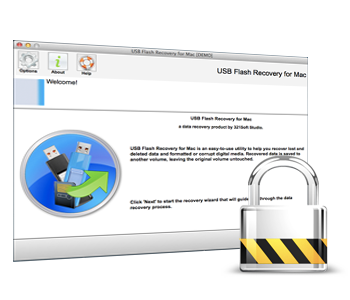 1 USB Flash Recovery software for Mac. Free Download 321Soft USB Recovery today and rescue your photos and videos!